Marit Bjørgen proved once again why she is the world’s best, saving one last attack to skate past Norwegian teammate Therese Johaug to take victory in the Holmenkollen 30 k and make it a clean sweep of the sprint, distance, and overally World Cup titles. Astrid Jacobsen outsprinted Sweden’s Charlotte Kalla for third place. Norway’s Sjur Røthe studied the tapes of Holmenkollens past, including how Petter Northug has taken some of his many wins. He had a plan, and executed flawlessly, beating Switzerland’s Dario Cologna by just a toe length to earn his first ever World Cup victory. 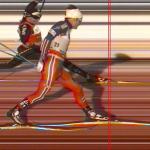 Norwegians dominated the podium in the last World Cup sprint of the season on Wednesday in Drammen, Norway, with Eirik Brandsdal taking the win, but finishing behind teammate Finn Hågen Krogh in the race for the overall sprint title. Maiken Caspersen Falla shook off a slow start and problems with heat selection to win in Drammen, Norway, the last sprint competition of the World Cup season. 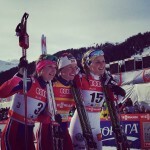 Norwegian teammate Marit Bjørgen added the Sprint Cup title to her overall World Cup crystal globe, which is already clinched with one competition to go. Marit Bjørgen topped Norwegian teammate Heidi Weng by 17.3 seconds to win the last classic-distance race of the season and complete her sweep of the World Cup weekend in Lahti, Finland. Norway’s Brandsdal Wins Crash-Filled Lahti Skate Sprint, Newell Eighth for U.S.
Norway’s Eirik Brandsdal stayed ahead to avoid turmoil and seized the win in Saturday’s World Cup freestyle sprint in Lahti, Finland, while American Andy Newell won his quarterfinal and finished fourth in his semifinal for his best result of the season. There will be several things to keep an eye on during this year’s 42nd American Birkebeiner, including top competitors, like two-time U.S. Olympian Holly Brooks, and a brand-new bridge just a few kilometers from the finish. Watch it live and follow our post-race coverage. Russia’s Maxim Vylegzhanin outsprinted the field, and Switzerland’s Dario Cologna, to win Sunday’s 30 k skiathlon in Rybinsk. Finland’s Matti Heikkinen placed third, and Russia took six of the top eight. Italy’s Federico Pellegrino skied himself into the history books after his victory in Saturdays sprint race in Rybinsk, Russia, denying Russians a victory at home for the second day in a row. Dario Cologna was victorious in Friday’s 15 k freestyle in Rybinsk, Russia and in the process thwarted four Russians who were gunning for a home-country podium sweep. Russia’s Alexey Pethukov and Sergey Ustiugov emerged as a team-sprint force to be reckoned with in the first team sprint of the season and last one before World Championships, and Canada’s Jess Cockney and Lenny Valjas teamed up for eighth. Without the big show of Marit Bjørgen in Saturday’s classic sprint, Norway’s Ingvild Flugstad Østberg rose to the occasion, notching her first World Cup classic-sprint victory and fourth podium of the season. Martin Johnsrud Sundby of Norway overtook teammate Petter Northug at the base of the Alpe Cermis hill climb to win the final stage and secure his second Tour de Ski title in the process. The only thing that can stop Norway’s Marit Bjørgen from winning her first ever Tour de Ski title is herself. Entering Thursday’s fifth stage, a 5 k skate pursuit, in Toblach, Italy, Bjørgen had a 1.34.3 advantage over teammates Heidi Weng and a 2.16 lead over defending Tour de Ski champion Therese Johaug. If either Weng or Johaug wanted a chance to catch Bjørgen, the oppurtunities were winding down and they needed to catch her today. Alexey Poltoranin proved that once in a while you just need to muscle your way to first place. He opted to use skate skis and double poled his way to the victory in Wednesday’s 10-kilometer classic race, the fourth stage of the Tour de Ski in Toblach, Italy. Norway’s Marit Bjørgen proved once again that she is the hands down favorite to with this year’s Tour de Ski competition by setting the fastest qualifying time in Tuesdays 1.4 k course and continuing that pace all the way to the final. How much did Norway’s Marit Bjørgen have left and could anybody beat her? That was the question on Sunday in the women’s 1.3 k freestyle sprint on the last day of racing before the holiday break. One young Swede came close. Marit Bjørgen had a lot of history riding on Saturday’s 10 k freestyle — if she or any other Norwegian woman won it, their team could go down in the record books with the longest World Cup winning streak. But mostly Bjørgen was looking for her first distance win of the season.